Beth, LOL!!! Yes, I love my handbags. 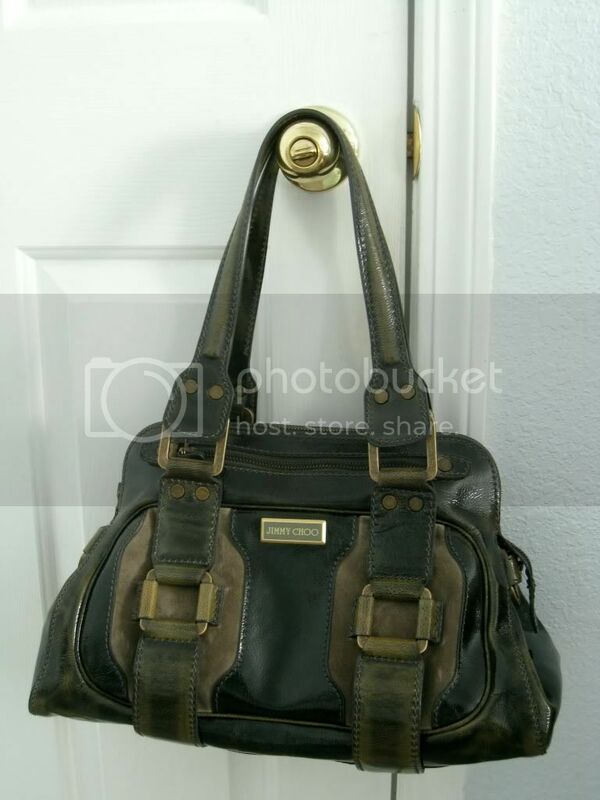 I don't know the brand of this one as there is not a label but it is a khaki olive color (perfect for summer) with gold trim. It has 2 deep pockets with zippered closures & 2 smaller inside pockets. On the back it has an outside zippered pocket. It's a nice medium size with a handle on top but does have a long strap if I want to use it as a shoulder bag. I always like shoulder straps so I can put it over my shoulder and across to the other hip. Seems like I'm forever trying to balance purse, bags, lunch bag, and/or grandkids so I like being able to wear it over the head. I've bought a few that didn't have the shoulder strap and I always end up putting them in the goodwill bin after a few uses. I do like your Jimmy Choo bag. Mine is more brown in color but is about the same size. I'll take a photo of it later today & post it. I do love my handbags & this is the most that hubby has ever spent on one for me. One year, we bought a really nice one at Dillards for our daughter for Christmas that was on sale for $98. I borrow that one from her on occasion as she is into zebra prints now. She also likes Vera Bradley bags. I prefer leather bags over vinyl any day of the week & this is genuine leather & seems to be well made. I am beginning to purchase quality over quantity but still like to change up my handbags. Same here and I'm very picky. I like lots of pockets inside and out as well as a divider in the main center part of the bag and a zipper closure on the top with dual straps. Not too deep either as the contents fall to the bottom and I have to go digging for them! I had a leather one from Stone Mountain years ago that I loved. Have never found one that compared and wish I'd kept it to make another even if it was fabric. I bought one a couple months ago that would be almost as lovable but it's too deep. Maybe I'l get off my hiney and make one from that Tulip pattern I bought after I clean up my table...made a guitar strap the other day and still have the mess/extra fabric on the table. Now that's one good looking purse Beth. MartySews2 wrote: I am beginning to purchase quality over quantity but still like to change up my handbags. Oh, I have a very, very small closet & don't keep more than 4 or 5 at a time. I buy a new handbag every year or so. When they start looking worn, out they go to the donate pile even if I love them. My daughter has over 20+ handbags so if I need something different, I borrow from her. Guess I should make some for me but I like the one that hubby bought for me on Saturday. I found a label inside that said Elise Ms. Got lots of compliments on it today.